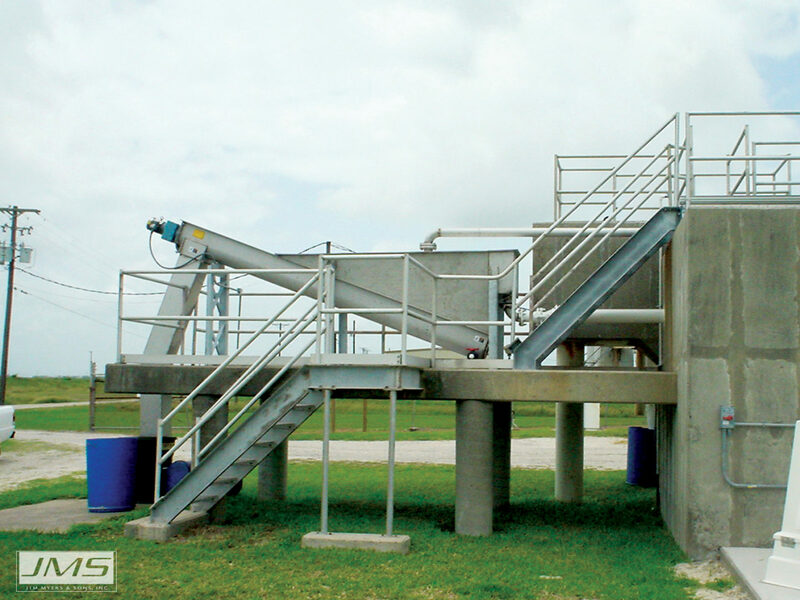 Grit and other inorganic solids in the wastewater treatment process can accelerate premature wear on pumps and other mechanical equipment. It can also cause blockages in piping, can settle in basins (reducing their effective capacity), and increase the potential for plugging. 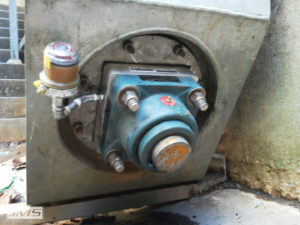 Unplanned maintenance of mechanical equipment can result in downtime, and increase plant costs. 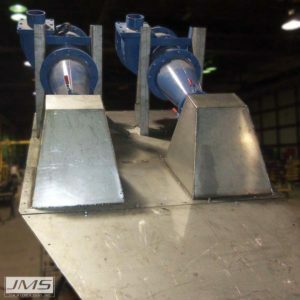 JMS Delta-CLASSIFIER (Grit Classifiers), also known as grit screws are used to separate grit, organics, and other solids from the waste stream and provide a concentrated discharge of material ready for disposal. 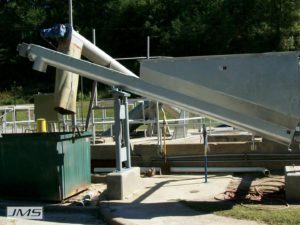 Solids disposal has become a significant issue due to rising disposal costs and new restrictions. 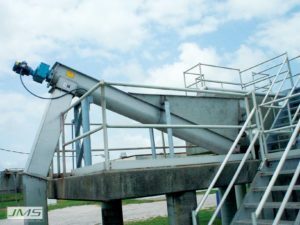 In addition to the separation, removal, and dewatering of the grit material, removing organics from the grit stream is also desirable. 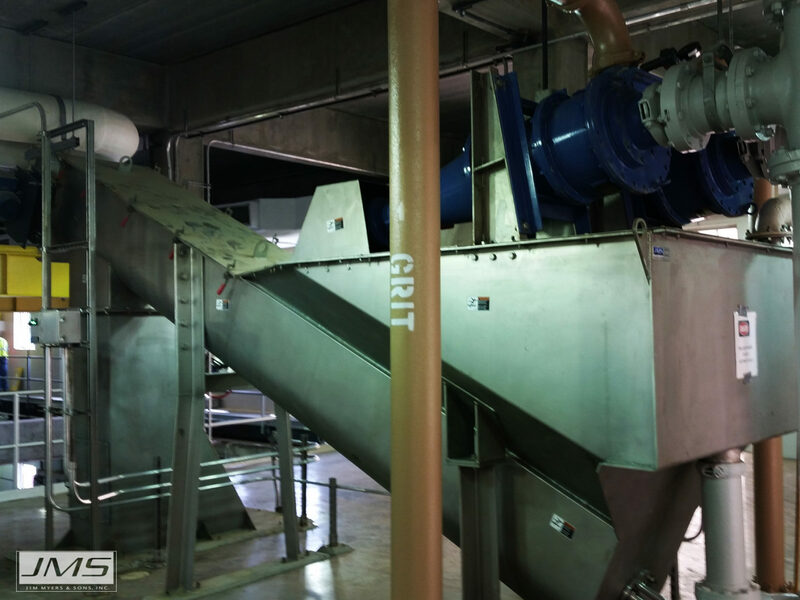 The water separated from the grit, along with the organic material, is fed grit-free back into the plant’s process stream. Solids conveyance capacity is a key design parameter for the Grit Classifier. However, due to the large amount of water versus solids, Grit Classifiers are primarily sized based on the hydraulic volume of flow. 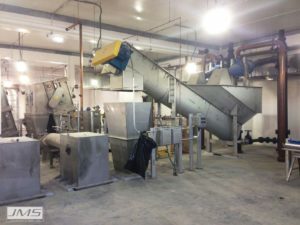 The use of cyclone separators are considered as the flow rate to the Grit Classifier increases, allowing for a reduction in the size of the classifier. 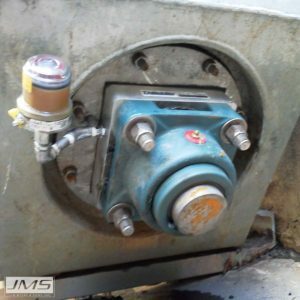 JMS external bearing is designed to offer better access for maintenance and keeps the bearing out of the bottom of the hopper where grit collects. Hydrocyclone(s) can be included, increasing system capacity up to 1500+ GPM. JMS uses a high strength, abrasion resistant, alloy steel shafted screw. Weld-on or bolt-on wear shoes are also available for highly abrasive applications. 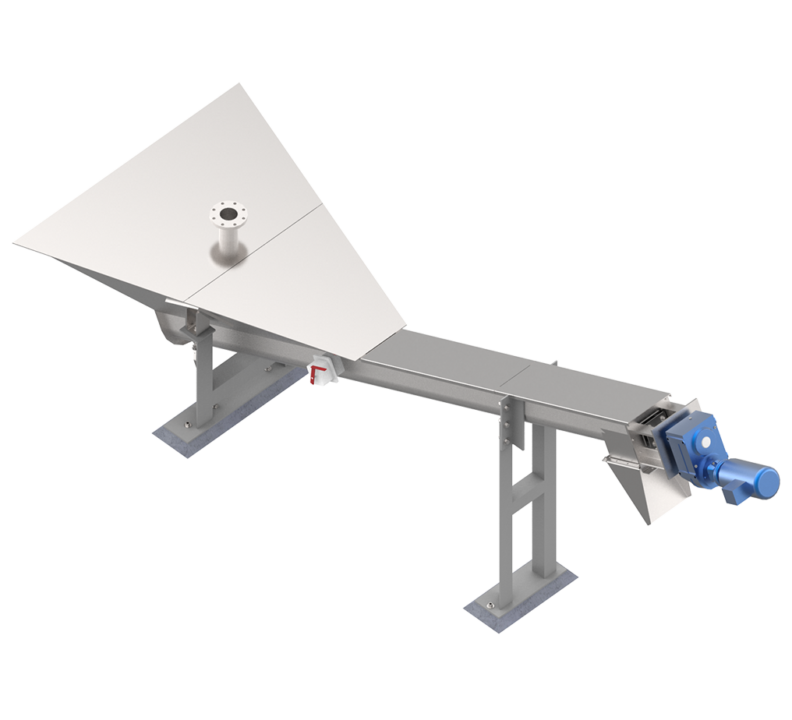 The JMS Delta-CLASSIFIER (Grit Classifier) can be designed to suit the influent flow demands of any process and can be supplied with or without hydrocyclones. 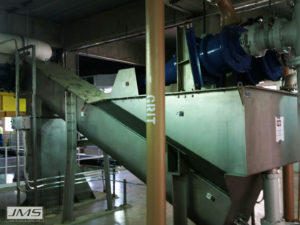 Totally enclosed, the system design of the inlet, shape of the hopper, baffles and conveyor contribute to minimize turbulence and increase settling efficiency. 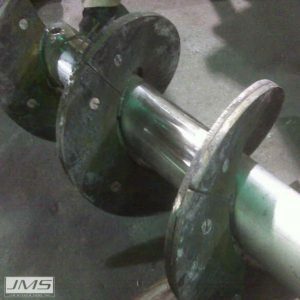 For maximum performance in this harsh environment, JMS uses a special alloy steel shafted conveyor, and a proprietary external bearing for long life expectancy. 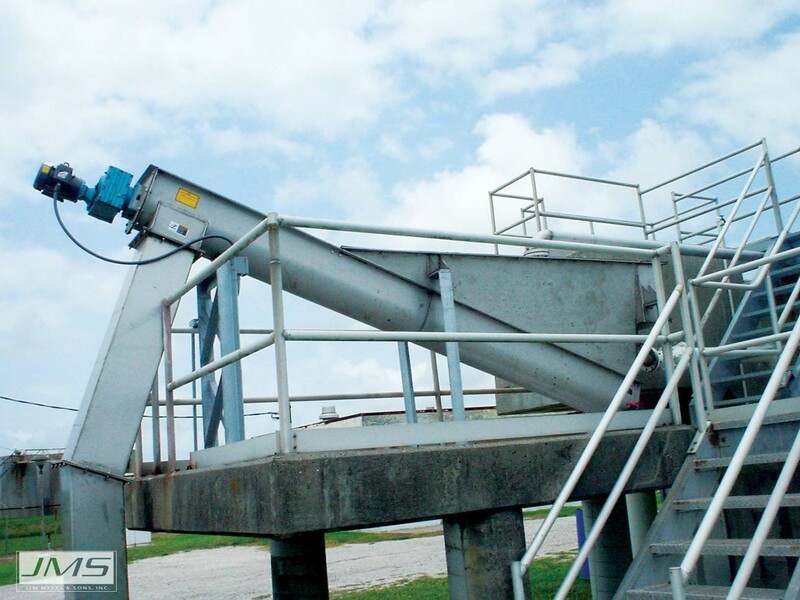 The JMS Delta-CLASSIFIER (Grit Classifier) typically receives a grit slurry of one to three percent solids from grit or airlift pumps. The system’s hopper and baffles are carefully designed to accommodate influent flow to maximize settling efficiency. 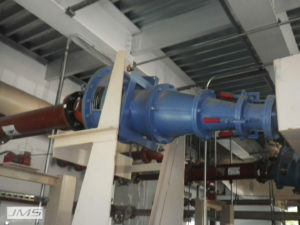 Inside, an overflow weir provides a constant volume and surface area. 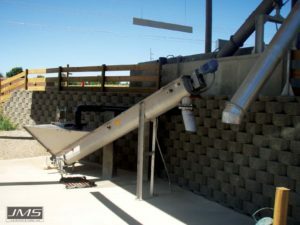 A slow speed shafted screw conveyor, typically five to ten RPM, conveys grit from the bottom of the hopper to the outlet for disposal. The water, including unattached organics and other floating material, is decanted over a weir and returned to the process stream grit free. For this highly abrasive application, the Delta-CLASSIFIER (Grit Classifier) is supplied with a stainless steel housing and high strength, abrasion resistant, alloy steel shafted screw. Weld-on hardening or bolt-on wear shoes are also available. JMS uses an external lower bearing assembly. This is a simple concept that offers both visibility and access to the bearing, keeping the bearing out of the grit in the bottom of the hopper. The assembly consists of a roller bearing providing support for the shaft, and a heavy duty adjustable grease purge type seal. Internal bearings can also be provided. 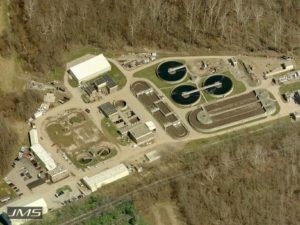 The LeSourdsville Water Reclamation Facility is located between Hamilton and Middletown, OH in southeast Butler County and discharges clean water to the Great Miami River. Historic Butler County is where the first fort was built on the bank of the Miami River. Named after a general in the Revolutionary war, today it is the home to over 50,000 residents and many industries. 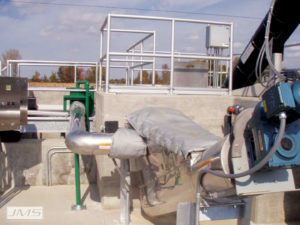 In 2007 Hazen and Sawyer Engineers completed a master plan for the LeSourdsville WRF to increase their ability to comply with future changes in regulatory limits, and to provide additional wet and dry weather capacity. 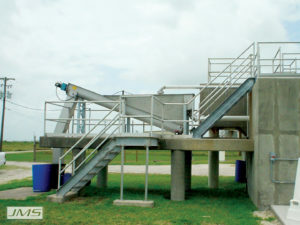 To be completed in three phases, it included a new preliminary treatment facility with fine screening and grit removal. 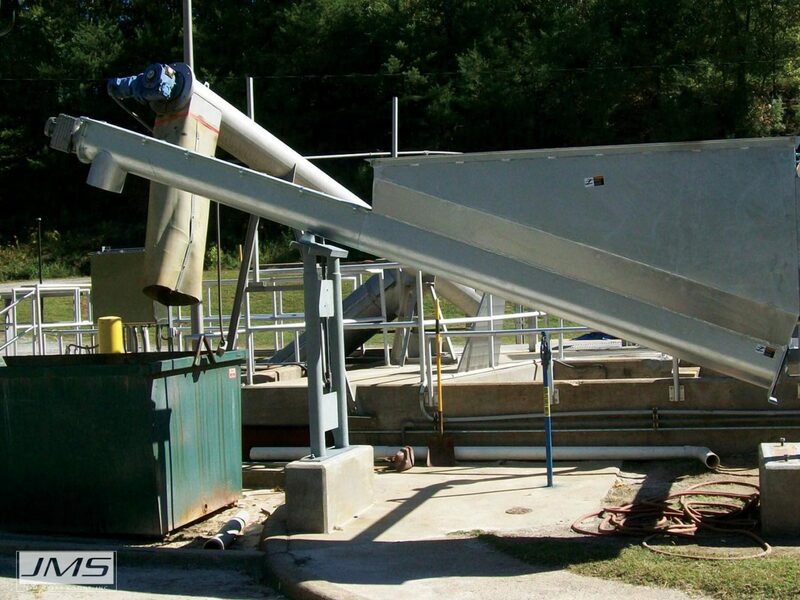 As part of this project, two freestanding JMS Delta-CLASSIFIER (Grit Classifiers) with hydrocyclones and a JMS Bio-BELT (Belt Conveyor System) were installed to separate, concentrate and transport grit for discharge from the process. The two Delta-CLASSIFIER (Grit Classifiers) have now been in place over five years with trouble-free operation. The JMS success at this facility precipitated the use of JMS Delta-CLASSIFIER (Grit Classifiers) in one of this engineer’s next projects.